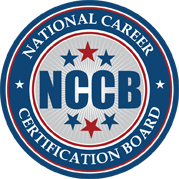 National Career Certification Board’s (NCCB) Certified Catering Associate (CCA) designation encourages the professional development of caterers through voluntary participation. Certified Catering Associate (CCA) designation raises the level standards in the industry and will give you an edge over your competition by taking the entry-level comprehensive examination and providing credentials for employment. The benefits to becoming a Certified Catering Associate (CCA) may include more job opportunities, higher wages, and increased job security.